Workplace violence is any act or threat of physical violence, harassment, intimidation, or other threatening disruptive behavior that occurs at the work site. It ranges from threats and verbal abuse to physical assaults and even homicide. It can affect and involve employees, clients, customers and visitors. However it manifests itself, workplace violence is a major concern for employers and employees. In most workplaces where risk factors can be identified, the risk of assault can be prevented or minimized if employers take appropriate precautions. One of the best protections employers can offer their workers is to establish a zero-tolerance policy toward workplace violence. This policy should cover all workers, patients, clients, visitors, contractors, and anyone else who may come in contact with company personnel. An individual injured by a violent employee may claim that the employer was negligent in failing to conduct adequate pre-employment screening or criminal background checks to identify the employee’s violent tendencies, or in placing an employee with known or suspected violent tendencies in a position of potential harm to others. These two legal claims, referred to as “negligent hiring” and “negligent retention/supervision,” can cause significant liability for employers. The general elements of a negligent hiring or negligent retention/supervision claim are: (1) the existence of a legal duty to exercise due care, (2) breach of that duty, and (3) the breach is the proximate cause of the plaintiff’s injury. Proximate cause is a legal term of art that relates to the foreseeability of an event occurring due to an employee’s behavior. 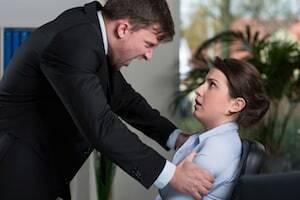 For that reason, an employer will typically only be liable for workplace violence if the risk of harm from the violent employee was reasonably foreseeable. Even if you have not yet been victimized by a violent act in the workplace, if an employee has threatened you with violence, you and/or your employer may be able to obtain a temporary restraining order (TRO) against the employee prohibiting him/her from committing violence or threatening violence against an employee in the workplace or in the scope of performing his/her job. Under Georgia law, a TRO obtained by the employer is effective for up to 15 days. Thereafter, the court will hold an evidentiary hearing to determine whether an injunction (lasting up to three years) should be granted. Depending on the circumstances, an employee may be eligible for workers’ compensation if he or she is assaulted in the workplace during working hours. If you believe an employee at your company is at risk of committing an act of violence or you have been the victim of workplace violence or threats, we can help. Contact the Atlanta workplace violence lawyers at Fidlon Legal for an initial case evaluation to assess your case.